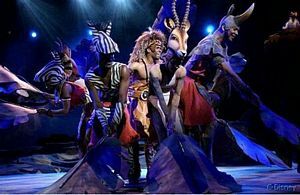 Join Simba and friends in this Broadway-style production which retells the enchanting story of The Lion King. Complete with dazzling special effects, spectacular costumes, and the familiar songs you all know and love. Best time to visit: Up to 5 performances daily. See below for ticket information. Tickets are no longer needed to see the show. The shows alternate between French and English language. Be sure to go to the English language show. Arrive 20-30 minutes before showtime to get a good seat location. If you miss out on a seat, you can still see the show from Cafe Hyperion, although not as good of a view as from inside the Theatre.